Bullet Review:Book 100 of 2017 is DONE! WHEW! Ah, now this is much better! With The Oasis, Pauline Gedge has hit her stride with this story arc in general and her characters in particular. The strengths of The Oasis only serve to highlight the weaknesses of The Hippopotamus Marsh.I mentioned in my review of The Hippopotamus Marsh how the characters seemed to suffer from a lack of realism and I think part of the problem is that that first book of Lords of the Two Lands Trilogy is a set-up book. We meet Seqenenra, the instigator of the story's plot and about whom the main action revolves, at the beginning of the book. However, before we can fully know and understand him and his motivations, he's killed and his active participation in the story is over with, about midway through the book. Then we find ourselves involved with the brothers Si-Amun, Kamose and Ahmose; nominally it's Si-Amun who leads the story line, but then he goes away and Kamose takes his place. Basically, there's so much going on and so many people weaving in and out of the main plot line, it's hard to get a grasp on who these characters really are, what drives them, what they're hiding behind their smiles. However, with The Oasis the focus pretty much stays on Kamose and to a lesser extent Ahmose. Finally we get to see more of these two characters; we get to delve into their fears and hidden talents and discover what makes them tick. Finally we get an idea of who they really are. This discovery also extends to the Tao women. We get to see beyond Tetisheri's imperious facade and see her fears and her weaknesses. Aahotep and Aahmes-Nefertari step out of the shadows and become deeper and richer, more than just mother and widow, wife and sister. Now I can see these people. Now they have become real.Once again, though, the battle scenes are still weak and underdeveloped. The action is briefly described and hastily done with. However, the tension has been ratcheted up by several notches and there are many scenes which caused me to hold my breath as betrayals and shocking revelations threatened to derail Kamose's attempts to retake Egypt and remove the Setiu stench from his country. Several times throughout the book, I ached with him and felt as exhausted as he when events overwhelmed him. And that is the one constancy between The Hippopotamus Marsh and The Oasis: Gedge's masterful use of language and imagery. She skillfully weaves the ancient history and traditions of Egypt into the story, engaging all the senses and immersing the reader totally. As I noted before, Gedge manages to keep the reader's attention focused in that ancient period by using appropriate language without alienating the modern mindset with stuffy or awkward turns of phrase. Which is why I was quite surprised to find a slip-up. Towards the end of the book, (view spoiler)[ when a few of the princes rise up in rebellion (hide spoiler)], Prince Iasen cries out, in regards to General Hor-Aha, "We are tired of kowtowing to him." (Italics are mine.) Kowtow is from the Chinese ketou which is a combination of the syllables ke knock + tou head. I realize the ancient Egyptians were in trade with many other ancient societies at the time, but would they have used such a word? Even if they would, which I doubt highly, the use of it in the text brought me temporarily out of the story--it jarred me. I think it a better choice would've been the more neutral genuflect or prostrate. I mean, Gedge might as well have written salaam. However, that is the first and so far only error I've found in her novels.Which is why, in the end, I'm sticking with my initial judgment which placed Gedge head and shoulders above nearly all other ancient Egyptian historical fiction authors. It's often easier for me to review the books I dislike because I can usually rant about the things I didn't like for ages. It's less easy for me to write a review about a book I love that's not all flaily and squee-ridden and basically, "OMG THIS BOOK IS SO AWESOME, EVERYONE SHOULD READ IT". And that's basically my incredibly fangirly, immature reaction to The Oasis. It's an amazing, amazing read and I think that The Lord of the Two Lands trilogy may just be my favourite fiction books set in Ancient Egypt, ever. And that's without having even started The Horus Road.After loving The Hippopotamus Marsh so much, I was concerned that I'd be disappointed. Yet if anything, The Oasis is an improvement on the first book. The tension rackets up and there's more action and resolution. The ending is particularly stunning.The characterisations are also much deeper. The then-prince, now-king Kamose really comes into his own, and it's as a tragic hero that I can't help but love and pity. The character of Ahmose is also developed, given depths that weren't present in the first volume – I really like the arc he's going on, from the prince with the least responsibilities to (view spoiler)[ultimately, king and liberator. (hide spoiler)]. The Tao women were ultimately the biggest surprise. I knew of their importance in reality, and so was surprised when they seemed to take such minor roles in The Hippopotamus Marsh. Yet they do really step out and become these admirable, amazingly strong women that I know from history, and what's more, the type of female characters that I really admire. These are strong, awesome women of history, not some Nefertiti-turned-Mary-Sue.The effect of war, the cost of war, is also shown here. We seen the Tao family change, not always for the better, and lose loved one in the course of it. This is most evident through the character of Kamose, but it is true for all of Taos. I can't wait to start on the next book. 3.5A reading favorite among authors writing credibly about ancient Egypt ( versus fluffy romance that aspires to be a television miniseries...or merely forgotten as soon as possible.) Loads of battles and gore. If the first volume in this trilogy had as much gore as this second volume, would have skipped reading the last two. As it is, when one isn't mentally wiping off then it's total immersion in introspection. There is also a degree of headhopping within a single scene, supposedly a no-no. The author includes a list of characters which is quite helpful if it has been awhile since reading a prior volume. Unfortunately, there is no author's note in any of the volumes. It would have been edifying to have some idea of how much of the detail fits with what is known from the hieroglyphs and archaeology (as of when these were written). Of course it is known that the Hyksos were overcome, but how much of this story fits with known facts would be of interest. What can I say? I don't usually go in for battle and war but the author made me so invested in these brothers that I found myself marching along the Nile with the soldiers.And the women left at home had to become even stronger to manage the affairs of their little province while their men were gone. A worthy tale to be sure. It broke my heart that Kamose had to die from assassination. I know from history that Kamose had a short reign, and it's up to the author to fill up the gaps by using her imagination. Overall, I like that the scenery, how Kamose was portrayed, the family, the anguish at the betrayal, the personal growth of Ramose, Ahmes-nefertari, and Ahmose. But I pity Ramose, because he lost his family due to betrayal to the Tao, but he had a good head on his shoulders, though it really is difficult for him.I really like this book! And I am excited to continue the journey of the Taos, with Ahmose as the crowned king in the third book. Hoewel Gedge veelbelovend begon met deze trilogie, worden de minpuntjes uit deel 1 benadrukt in deel 2. De Oase begint traag en in het midden lijkt het bijna volledig stil te staan.Waar het in het begin nog wel interessant was om te lezen over de allerdaagse handelingen van de Oude Egyptenaren, zoals de badrituelen, de soort kleding en accesoires die ze dragen, wordt het na tien beschrijvingen niets meer dan saai en langdradig. Er is een opstand gaande, een oorlog aan de gang, wat interesseert het de lezer hoe vaak de prinsen van Waset zich baden per dag? Of dat ze een nieuwe linnen rok omslaan? Of welke band de prinsessen om hun pruik hebben geslagen?De eindeloze reeks vergaderingen en krijgsraden zijn zenuwslopend, afgewisseld met bovengenoemde eindeloze beschrijvingen. Er gebeurt nauwelijks iets. De paar gevechten worden kort beschreven, of helemaal niet, maar de gesprekken daarvoor worden te uitgebreid behandeld en tot in de details aan de lezer vertelt.Kamose bespreekt zijn tactiek met Ahmose. Vervolgens bespreken Kamose en Ahmose hun tactiek met Hor-Aha. Daarna bespreken de drie hun tactiek met de prinsen van Egypte. En elke keer worden dezelfde bezwaren naar voren gehaald tegen de besproken strategie, evenals dezelfde argumenten om hem toch uit te voeren.Kamose en Ahmose bespreken hun ongenoegen over de prinsen van Egypte met elkaar en dan met Hor-Aha en vervolgens wordt in de krijgsraad met de prinsen beschreven dat Kamose zich ongemakkelijk voelt en zich irriteert over de prinsen.Dat is veel te veel herhaling. En als dit dan allemaal nog weer wordt beschreven in een brief naar Tetisjeri (die de lezer ook leest) en later in het boek dan ook nog weer wordt besproken met Tetisjeri bij Kamoses thuiskomst, en daarna ook nog een keer met Ahhotep en Ahmes-Nefertari, dan is de lol van het lezen wat mij betreft een beetje verminderd.Het is jammer dat Gedge haar herhaling dan niet afmaakt en de werkelijke strijd - die zo uitgebreid is besproken - ook aan de lezer beschrijft. Vaak worden hier weinig woorden aan vuil gemaakt, eigenlijk te weinig. De balans tussen actie en dialoog is in de eerste twee delen van dit boek volledig verdwenen.Gelukkig kan ik dit boek toch krap aan vier sterren geven. Net over de helft van het verhaal, als de moedeloosheid dreigt toe te slaan, wordt het weer spannend. De confrontatie wordt opgezocht, er gebeuren weer dingen die ook werkelijk aan de lezer beschreven worden, in plaats van besproken in een dialoog met Kamose.Toch kan ik het idee niet loslaten dat Gedge zelf ook blij was dat haar ei was gelegd. Soms gaat ze hier zelfs een beetje te snel, alsof ze het boek wil eindigen, en krijgt de lezer niet de tijd om te begrijpen wat er gaande is. Zo is de transformatie van Kamose na zijn campagne in Wawat onbegrijpelijk en onbeschreven. En helaas zullen we in boek 3 ook niet weten hoe dat tot stand is gekomen.Ondanks de vrij grote kritiek op dit deel, blijft mijn respect voor het ontzagwekkende werk dat Gedge moet hebben verricht om deze trilogie te schrijven onverminderd groot. Alleen al in de beknopte bibliografie staan bijna 40 geraadpleegde boeken.Vandaar nog altijd 4 sterren voor dit boek. With his father (Seqenenra) and his twin (Si-Amun) dead, you would think Kamose would be ready to give up. But instead of standing by and watching his family torn apart by the Hyksos king, Apepa, he decides to fight. After all, he has nothing to lose and everything to gain. Kamose’s decision to fight irrevocably changes both himself and the fate of Egypt.Faster paced than her later work and filled with memorable characters, The Oasis is my favourite book in the Lords of the Two Lands trilogy. Of course I am biased because I love reading about ancient warfare, but Pauline Gedge has still penned a wonderful novel. Told mostly from the point of view of Kamose, she gives us greater insight into the man behind the ruthless reputation. His motivations are very believable and his internal struggles with the war are heart-wrenching, which makes him a very three dimensional character.“This trilogy is dedicated to Prince Kamose, one of the most obscure and misunderstood characters in Egyptian history. I hope that in some small way I have contributed to his rehabilitation.”I truly believe that Pauline Gedge has contributed a lot to the rehabilitation of the infamous Kamose Tao, in much the same way Marcus Crassus was rehabilitated in my eyes by Andrew Levkoff. Her trilogy certainly changed my perception of the great leader and I hope it changes yours as well.I give this book 5/5 stars. A magnificent sequel which, in many ways, even surpasses the first novel. Gedge is a wonderful author of historical fiction, with the power to effortlessly recreate the mysterious and wonderful world of ancient Egypt without bogging the reader down in too much unnecessary detail. The ultimate test for the writer of historic fiction is in looking to see the balance that is struck with fact and fiction, and Gedge has blended these together seamlessly, never losing the dramatic pace and integrity essential to keep readers wanting more without abandoning her endeavour for historical accuracy.I enjoyed The Oasis more than I did the first book, mostly because I think because the story of Egypt’s fight for freedom starts to pick up pace around the time Kamose becomes Pharaoh, but also because of the nice twists that were placed here and there in the story. Characters have developed significantly since the first novel, and Kamose is a lot more identifiable this time round - no longer just the quiet, brooding second son - than he was in the first book. Very enjoyable and it’s sure to make readers want to know what happens next in the last instalment of this exciting trilogy. Decidedly the best Gedge I have read. First and foremost, this is a powerful character study of Kamose, his drives, his insecurities and doubts, his compensations and confidence, and the ruthless decisions he finds he must make to recover Egypt for Egyptians. In this reading, I discovered a truly complex young man of power, defined by his father's initiative, driven by the the necessity he sees for himself, guided by the strengths in his grandmother, his mother, and his sister, and moderated by his brother. This book demonstrates a truly exotic culture made remarkably real, tight family bonds, deep religious devotion, and gripping politics amid civil strife. The real people truly come to life and the fictitious characters simply help give flesh to the whole story. A word of warning: The Oasis does not stand on its own; to truly make sense it does depend on volume 1, The Hippopotamus Marsh. I look forward to getting into volume 3, The Horus Road. This is the second of a trilogy. I will do a more in-depth review once I've completed the next installment. The writing is vivid and well-researched. Pauline Gedge is a brilliant historical fiction author- her words propel you into a different time and place. Ancient Egypt is so fascinating. The more I read, the more involved I became in the story. I believe this series is good reading for all. It has many masculine qualities- brotherhood, war stratagems, familial pride and so forth. It also possesses feminine feel. There's is love and a softness that at times hard militant novels lack. Egyptian names often stem from their religion. Ra, Ka, Amun, Ankh, etc. Reading these novels feel spiritual. I like Gedge's historical fiction, but more fiction and less historical.Second in the Tao trilogy, here we see Kamose taking up his father's cause, raising an army against Apepa, and capturing most of the Delta before the end of his story here, and leaving the third some Ahmose to take up the cause in the next book.Faster paced than the first one, hopefully that holds true to the third and final book. Gedge continues to demonstrate her strength at characterization and evoking ancient Egypt. However, her weaknesses at military matters remains. And since this book in the series has more military action than the previous book, that weakness is more evident here. Not only are the depictions of battle vague and unconvincing, but the military strategies themselves are head-scratching. Still, it's a strongly written and plotted series, and I look forward to the concluding novel. 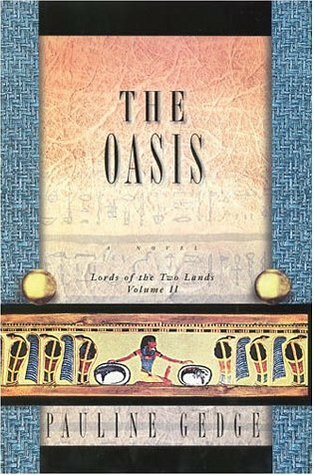 The book ends with the murder of Kamose and his brother Ahmose becomes the new king at Thebes but he must defeat the Hyksos in the Delta. Sequel is "The Horus Throne"Book ends with a real tribute to the women of this royal family. The Oasis by Pauline Gedge follows beautifully the first in her series, The Hippopotomus Marsh. This time the story is of Sequenenra's son and successor. Kamose inherits the fight to regain Egypt from the usurping Setiu, Apepa. A great story. I can hardly wait to read volume three, The Horus Road. Not as strong as her others featuring female protagonists - a sluggish starter, but does improve as it wears on. Man, is she great at making ancient Egypt come alive. Part 2 of the series - just as good as Part 1. I liked how the author can build up tension. but I think I'll pause for some time before reading 3d book. Excellent depiction of 17th dynasty Egypt.This author is a wonderful writer. A winner. So much better than book #1 (but you need to read 1 for the background). I couldn't put it down at times.